Stinging nettles are tricky to handle, but a brief exposure to heat tames these prickly vines into super flavorful greens—sort of like if spinach had an older brother who came home from college. Their deep, earthy flavor always reminds me of rich soil, damp from winter and ready to burst forth with new plants now that spring is here. Serve these simple nettles all on their own, especially at the beginning of the season, or use them to top pasta or pizzas for a hit of brilliant green. Note that one way or another you need to clean the nettles. You can do this as you would other greens, wearing gloves to protect yourself, or, easier and better, blanch them, which will take their sting out, and then rinse them. Blanching nettles is basically a two-fer: the nettles get cleaned, de-stung, and broken down in one fell swoop. Cooking will tame the sting of nettles. First, though, you need to clean them. You can do this (wearing gloves) by swishing them around in a large sink or basin filled with cool water, lifting the nettles out (leaving any grit behind), and draining them. Or, slightly more manageable, blanch them by dunking them into boiling salted water and cooling them quickly in a bowl of ice water or under running cold water. 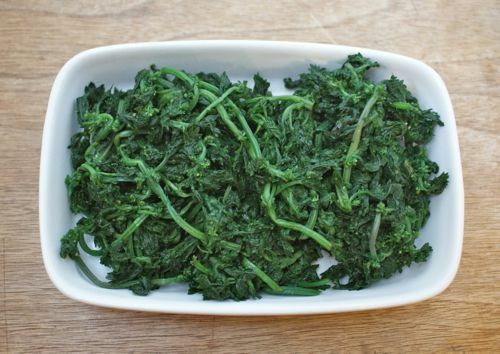 If you choose to blanch, make sure to squeeze the nettles as dry as possible before sautéeing them. However you do it, set the cleaned nettles aside. Heat a wide pan (or a pot if you didn't blanch the nettles) over high heat. Note that the wideness of the pan or pot will help any liquid cook off quickly so the nettles sauté instead of steam. Add the oil, butter, or other cooking fat, swirl to melt and/or heat, and add the nettles. Cook, stirring frequently, until the nettles are tender, about 2 minutes for blanched nettles and a few minutes longer for raw nettles. If sautéeing raw nettles, make sure to keep the heat high so the liquid they throw off as they cook evaporates quickly. Garlic: Sauté a clove of minced garlic, a spring onion, or a shallot to the cooking fat and cook, stirring, until fragrant before adding the nettles. Spice: Include a sprinkle of red chile flakes in the cooking fat before adding the nettles. Lemon: Spritz on a bit of lemon juice before serving. Cheesy: Top with freshly grated Parmesan cheese or other hard grating cheese. OIl It Up: Drizzle with extra virgin olive oil, walnut oil, or toasted sesame oil for a final hit of flavor before serving.